I know some people don’t like to fall into the trap of or even believe in New Year’s resolutions; but I’ve always liked the idea of working toward goals. And yet, I haven’t taken the time to sit down and formally write my list of resolutions for 2015. I can’t say that I will at this point either. Admittedly, I meant to do this over my holiday vacation, but other things got in the way. Rather than beat myself up about it, I came up with a very simple idea for how I wanted to approach 2015 in such a way that negated the need to write this long list of things that I would likely never get to because…you got it…life got in the way. Instead, I simply told myself that I wanted to have something to look forward to every day. I think this is a much more realistic and manageable way to deal with life at the moment. The great news is that it doesn’t have to be anything big. In fact, it will likely be the small things most days: a latte from my favorite café, heading home to binge watch Girls (my current obsession), meeting a friend for lunch, or curling up with a good book and my favorite candle burning nearby (see #3 below). I haven’t sworn off New Year’s resolutions entirely – but I’m giving it a break this year. I will share that there is one main area of my life that I am aiming to make a big change at this year, that will require some thought and course of action; but really, I just want to spend more time being present, enjoying the little things. As such, I’m lovin’ things that embrace small pleasures, things that aid in my goal to have something to look forward to each day. 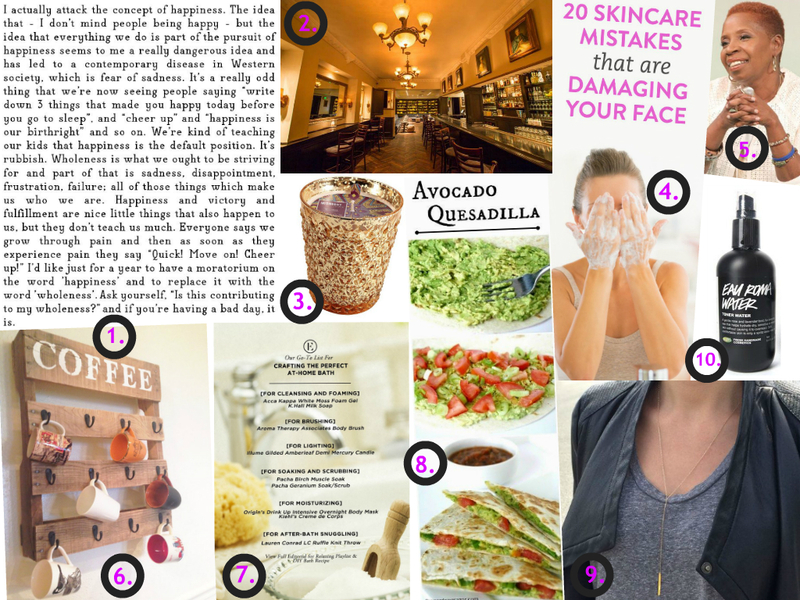 Below you’ll find a few ideas that I have in mind – be it the perfect bath after a long day (#7); a DIY project to sink my teeth into (#6); trying a new, healthier recipe (#8); planning a date night with my guy (#2); or treating myself to a little bling (#9). There’s always something to look forward to, and for once, I want to take it day by day. 1. A fresh take on why we’ve got “happiness” backwards. | Enlarge to See Full Quote. 2. Where to go when you need a date night. | The 13 Best Date Spots in LA. 3. The best smell in my apartment as I type this. | Bella’s “Midnight Orchid” Soy Candle. 4. In case you thought you were doing everything right on the skin front. | 20 Skincare Mistakes That Are Damaging Your Face. 5. A quick reminder of your birth-given power. | 7 Things You Don’t Know About the Power You’ve Always Had. 6. Inspiration for what to do with all those damn coffee mugs taking up unnecessary cabinet space. | DIY Pallet Coffee Cup Holder. 7. Everything you need to turn into a prune from the comfort of your own home. | Crafting the Perfect Bath at Home. 8. What to do when you perpetually have avocados and tomatoes ripening faster than you can eat them. | Avocado Quesadillas. 9. Feeding your minimalist jewelry binge. | Bar Drop Necklace. 10. Because winter reeks havoc on your skin…and it won’t win. | Eau Roma Water (a personal favorite at the moment).